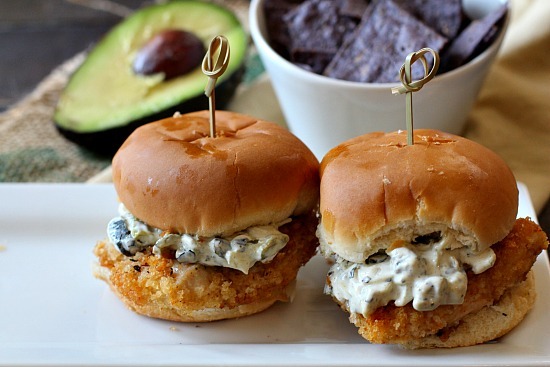 Fried Chicken Sliders. Panko breading laced with cayenne, cumin and chili powder wraps around tender sauteed chicken breast. And how about that zesty Poblano Mayo ??? I hardly know where the itch for these fried chicken sliders came from. I can’t say I’ve ever seen a fried chicken slider on a restaurant menu. Perhaps it comes from my love of fried chicken, and my fancy for all things Mexican food. Or maybe it’s because my slider board on Pinterest is my most popular. I do know I’ve been looking to make more Mexican chicken dishes with chicken and it seems anyone with a pulse can’t resist a little slider. And then there’s the fact that I have a freezer full of roasted Hatch, Mirasol and Poblano peppers from last fall that I’m hoarding. With that said, these little chicken sliders turned out better than I expected. You’d think the tender chicken coated with spiced panko bread crumbs, which were sauteed into crunchy bliss would most surely be the star. But I’d have to say the Poblano Mayo deserves honorable mention. Tangy, creamy and with just the right amount of heat. The tang comes from a little pour of white wine vinegar before stirring the whole thing together. Vinegar with mayo may be one of those kitchen discoveries that just leads to trouble. Will I be able to eat just plain mayonnaise again? I hope you give this fried chicken sliders recipe a try. And if you do, please come back and let me know how you liked it and give the recipe a star rating. Your feedback is valuable to me for developing future recipes. 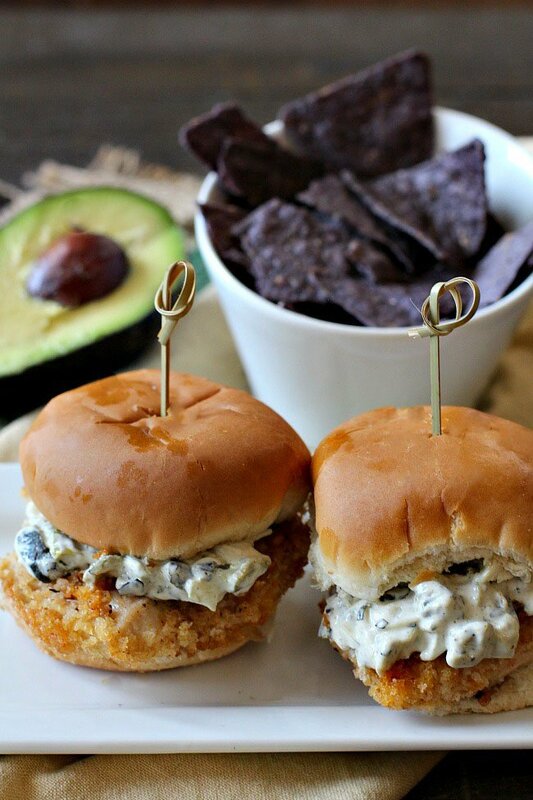 And if you have a favorite recipe for chicken sliders, let me know, I’d love to give it a try. Easy and incredibly tasty, these are great fried chicken sliders. In a bowl, combine Panko Bread Crumbs, chili powder, cumin cayenne, salt and pepper. Stir to blend. Cut the chicken breast in half horizontally, to make cutlets. Then cut those pieces in half. Trim just a bit so they'll fit the slider bun. With a meat mallet, pound to flatten just a little more. In another bowl, combine the mayonnaise, diced Poblano peppers, the chopped onion and white wine vinegar. Mix well to blend. Coat each chicken breast well with the Panko Bread crumb mixture. Heat a non-stick skillet over medium high heat. Add oil. When hot turn down heat to medium and add chicken cutlets. Brown on each side for about 3 minutes per side. Remove pan from heat and place a lid on the skillet. Just let those chicken slider steam for about a minute before removing and placing on the bun. Slather with the Poblano mayo and serve. South of the Border Sliders with Chipotle Mayo? Fried Chicken Sliders … It’s what’s for Dinner. Who cares where these came from? Just glad you dreamed them up and posted these sliders with all that peppery spice! Those look delicious! I wouldn’t mind just the fried chicken for a meal. The coating sounds tasty. 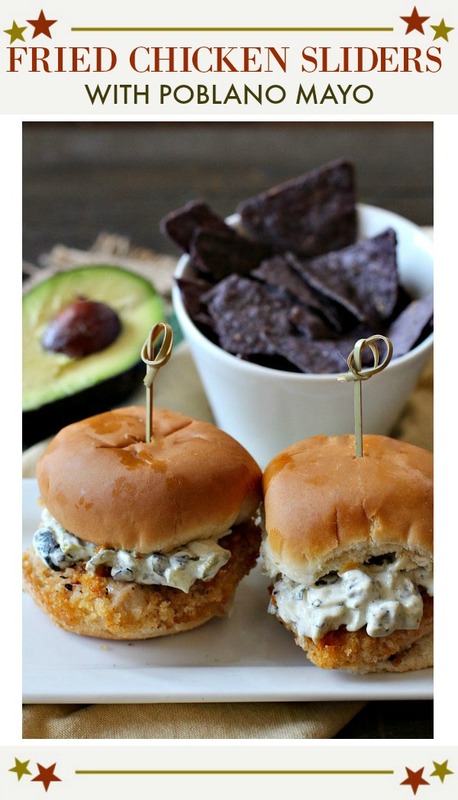 Wow, they look great and that poblano mayo must be the star ingredient in your sliders! These spell danger to me. Love poblanos and fried chicken. Not sure which I love most! Nothing better than a chicken slider! Great spice combo! 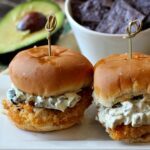 Love the creamy poblano mayo with the breaded sliders. YUM! Fried chicken? Yes, please. And these sliders are the perfect size! This looks terrific — love that mayo. Thanks! Oh my word, YES PLEASE!! Sounds like a tasty combination! They look and sound totally delicious LA. 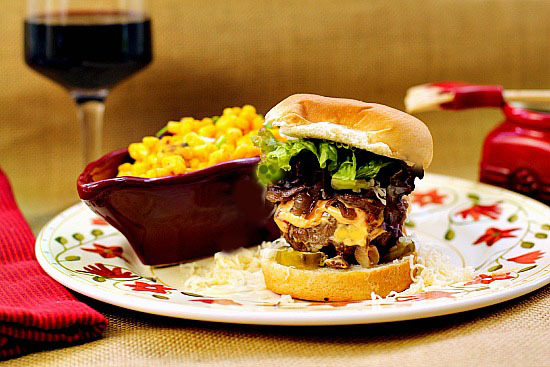 These sliders look mouthwatering Lea Ann, the poblano mayo sounds like perfection. I can see why your slider board is so popular. I could eat a couple for lunch and dinner. We loved these. Now that is my kind of sandwich, crunchy and spicy. Lea Ann, I don’t know how I missed this one, but I’m glad you tweeted about it today! I want one right this minute! And, yes, vinegar and mayo, well, there’s just nothing like it to jazz up a sandwich. PS I just realized my spoon rolls would make perfect little buns for these! I am guessing your neighbors have caught on and know that your house is the place to be for the best game food out there! These sound perfect for a Super Bowl party! I don’t need football to eat these! Bring ’em on!